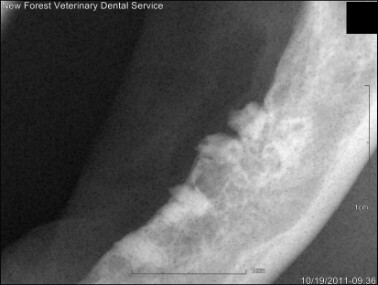 It is our opinion that dental procedures should not be carried out on animals without the use of dental x-rays. Our experience of second opinion dental procedures has shown that a significant number of complications arise from dentistry carried out in general practice where dental x-rays are not available or not used correctly. These complications are often simple to avoid with the correct facilities and treatment. Our vets all have access to the most up to date digital, dental x-rays and will use them on every case where appropriate. 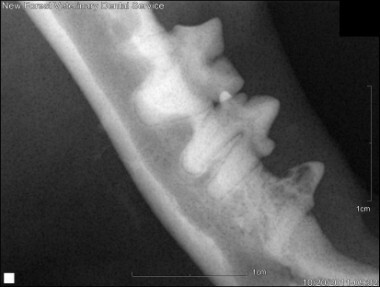 Dental radiography requires a huge amount of skill to perform and interpret correctly and our vets have an enormous amount of experience in doing so. How do we use dental x-rays? Assess anatomy: the conformation of the mouth, jaws and teeth, perhaps more than any other body system have the biggest variation in ‘normal’ anatomy between our dog and cat breeds. Some dogs will have very long jaws (e.g. Greyhounds and German Shepherd Dogs) and these breeds often will have very large teeth with very long roots. At the other extreme, we can see breeds with very short jaws (e.g. Boxers, Pugs and Persian cats). These breeds have the same number of teeth, but these are squeezed in and often rotated which can cause significant dental disease. We will often see differences in the anatomy of individual teeth which will alter our plan for treatment. Some teeth may have fewer or more roots than we would normally expect, or an abnormal position of roots within the jaw. Knowing these facts is essential before successful dental work can be carried out. We also always xray spaces where teeth are not present within the mouth. Sometimes these are genuinely missing and have never formed, sometimes they have been extracted previously, sometimes they are unerupted. Unerupted teeth will often go on to form a dentigerous cyst which are painful, fluid filled lesions within the jaw, and can cause extensive damage to the bones of the jaws. Periodontal disease – assessing the extent of disease and the tooth’s attachment to the bone. Tooth trauma – to assess the actual tooth damage and any disease present at the apex of the root within the bones of the jaw. Resorptive Lesions – effective treatment of these can only be carried out when the extent to the disease processes affecting the roots is assessed. This can only be done with dental x-rays. Chronic Gingivostomatitis – assessing all teeth affected by periodontal disease to allow effective treatment of this condition. To ensure all root structures have be completely extracted. Unerupted teeth which either require extraction or treatment to allow them to erupt. Orthodontics – to assess tooth pathology before attempting orthodontic treatment. We use post-operative x-rays to assess all our treatments where required, to ensure that the treatment has been carried out to the highest possible standard. For endodontic treatment, this means assessing the materials that have been placed within the tooth to ensure their correct placement. With follow up x-rays (carried out after 6 months), we can also assess any lesions that may have been present pre-operatively to ensure these are healing successfully following treatment. When tooth extraction is carried out, we use dental x-rays to show that all the tooth structures have been successfully extracted. One of the most common complication we see from dentistry carried out without the use of dental x-rays, are root remnants left in place after extraction. We all occasionally fracture tooth roots during extraction, due to the thin and fragile nature of animals’ tooth roots. 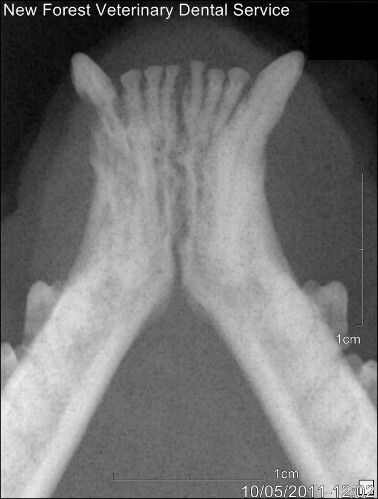 However, without dental x-rays, it can be almost impossible to then locate these fragments for extraction. However, it is essential that these root remnants are extracted. This is because tooth extractions are usually required to treat inflamed or infected dental tissue. If roots are left in place, then these can be a persistent source of inflammation and bacterial infection. Inflamed root remnants will almost certainly be a source of persistent oral pain and discomfort, and the bacterial infection around these can allow bacteria and their toxins to start circulating the body. From all of these examples, hopefully we have illustrated why we believe dental x-rays to be so important. 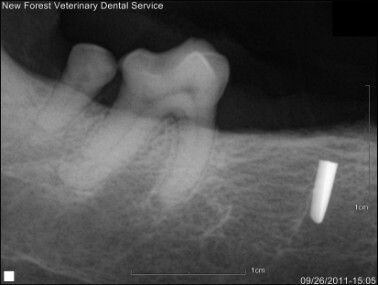 If your pet is going to have dental treatment, you must check with your veterinarian that they are going to carry out dental x-rays. We provide, along with others, postgraduate training for veterinary surgeons to help them carry out dental x-rays, but it is essential that they have access to these facilities as well. If you are a veterinary surgeon who has a dental xray unit but would like help to know how to take diagnostic dental xrays then please contact us and we can arrange a visit to you to provide 'in house' CPD training.